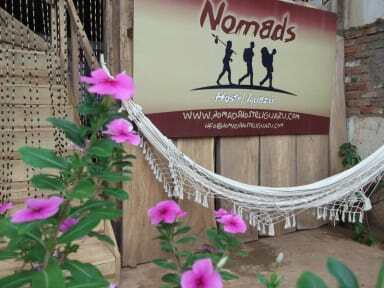 The Nomads Iguazu Hostel is located just 2 blocks from the bus station. Here, you can take many buses in order to reach the falls, Brazil and Paraguay. It is perfectly located in order to give you the best entertainment during any hour of night and day. Its proximity to the best restaurants and bars of the town make it a perfect hostel for young customers. In the nearby you will also find many shops, supermarkets and gift shops. The rooms are nicely decorated, spacious, clean and comfortably appointed ensuring all guests relax and peace. The hostel have five rooms: double, triple, and dorms. All the rooms have private bathrooms with hot water 24hs and air cond. /Heating. The Hostel has a common area with a fully equipped kitchen, cable TV, stereo and BBQ. We also have an outdoor garden with a swimming pool. Computer and internet WiFi are always available. Check out from 10:00 to 00:00. Ho dormito in questo ostello con 3 amici (quadrupla con bagno privato) durante un week end lungo per visitare le cascate di Iguazu. L'ostello è spartano ma si inserisce bene nel contesto in cui è costruito. La piccola piscinetta (dalla dubbia pulizia) è utilissima per rinfrescarsi, anche dopo il calar del sole con una bella birra (ottimi prezi anche in reception). Staff accomodante e alla mano, difficile pagare se non in cash. Colazione buona con servizio al tavolo per alcune vivande. Nice place, great location and breakfast. Beds were comfortable and rooms functional. Recommended! Great location just 2 minutes from the bus station. Friendly staff and good breakfast. Nice garden. Room very basic but clean. Bedlines and towels were provided. Recommended for a one or two nights stay. Nice hostel, a little basic but good value for money. The outside area with the swimming pool is nice if it's not raining. The guy at the reception was really helpful and friendly. Perfect location just 2 blocks from the bus station and close to supermarket and restaurant. Buena gente y posicion optima, pero la casa es practicamente en construccion. Faltan mosquiteros a las ventanas y las toallas por el baño son muy viejas.